Please test indoors before hanging your nestbox outside! The wires from the camera are in the plastic cable trunking down the side of the nestbox. The trunking has a cover that clips off and on. Remove this cover and connect the cables from the camera to the matching coloured leads on the extension cable. Clip trunking back securely to protect the cable joints! Now connect the white and yellow jackplugs into the matching sockets AV sockets on your TV. The audio on the camera is very sensitive and the nestbox creates an “echo chamber”, so you will probably want to keep the TV volume low until you find a comfortable level for you to hear nestbox activity. Also please place the nestbox at a reasonable distance from the TV before powering up the camera to avoid unpleasant feedback from the TV speakers when testing! Plug the power adaptor into your electric power socket (the power socket should be turned off at the wall at this point) then plug the red cable into the adapter. You may find the diagram at the end of this page helpful with this. Turn on the wall socket and you should see the inside of the nestbox on your TV. If not then you are probably not tuned to the correct (AV) channel on your TV so try changing channels. If the camera is not in focus or is not facing square towards the base of the nestbox unscrew the 2 or 4 screws in the lid, lift off the lid. Adjust the focus by gently turning the lens on the front of the camera whilst watching the TV screen until best clarity is obtained. Adjust camera position by very gently tilting on the bracket until correct. Carefully replace the lid once done.6. Finally disconnect the leads from the TV and hang the nestbox where desired. Keep exposed cable ends tucked carefully in the plastic housing until birds move in to protect from weather damage. First connect the white and yellow jackplugs into the matching sockets AV sockets on your TV. The audio on the camera is very sensitive and the nestbox creates an “echo chamber”, so you will probably want to keep the TV volume low until you find a comfortable level for you to hear nestbox activity. Also please place the nestbox at a reasonable distance from the TV before powering up the camera to avoid unpleasant feedback from the TV speakers when testing! Now unscrew the nestbox lid in order to secure the cables in the cable guard tubing provided and improve focus or position of the camera if necessary. If the camera is not in focus or is not facing square towards the base of the djust focus whilst watching the TV screen by gently turning the lens on the front of the camera. Adjust position by very gently tilting the camera until correct. Disconnect the camera jack plugs from the extension cables and push the plastic cable sheath over the connector point and up under the lid of the nestbox. Carefully replace the lid once all is in place and screw down again. When you wish to watch the nest you will need to push to end of the extension cable into the plastic sheath and join up the jack plugs. Meanwhile please use a wire tie to secure off the end of the sheath and keep the plugs protected from damp conditions outdoors. Finally hang the nestbox where birds are likely to nest! The camera will work in any ind of light but will default to black and white automatically when it is too dark for colour vision. To get better colour vision we have added an opaque plastic “window” in the side of the nestbox . Too big or clear a window could discourage birds from taking up residence in the box as they will see it as exposed to predators, we have made it a reasonable size and opacitywith this in mind! 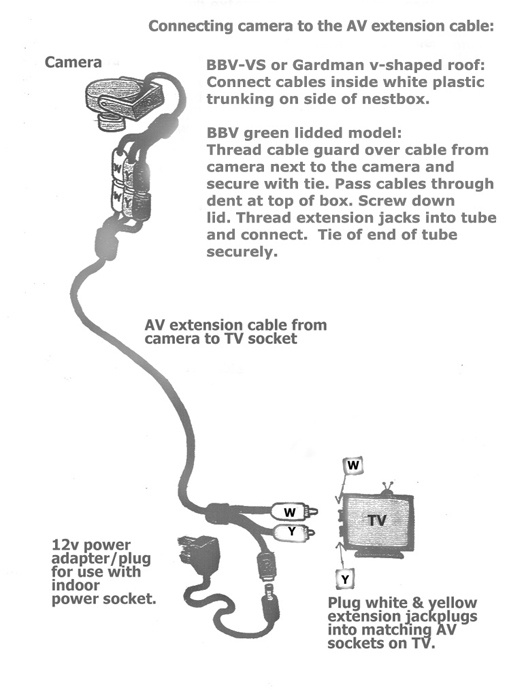 The diagram below shows the connection of the camera via the RCA extension cable supplied to the AV sockets of a TV. If passing cable ends through a hole in a wall please attach them to a rigid wire/dowel.